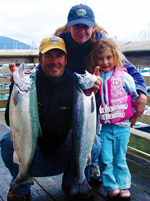 Captain Jack's Seafood Locker has been locally owned and operated in Seward, Alaska for over 15 years. Captain Jack's started as a small packaging and shipping facility for sport-caught fish. Soon we recognized the demand for premium Alaskan fish and seafood by consumers around the United States. We began cultivating sources for the highest quality wild seafood Alaska has to offer. We work with select local fishing families who care about the quality of their wild Alaskan seafood products as much as we do. As a family living near the source of Alaska's finest fish and seafood, we are concerned about the quality of the seafood we eat. We also take great care to make that same pristine-quality seafood available to our customers who are often thousands of miles away. To assure you receive the best seafood Alaska has to offer, we purchase only the highest quality fish and seafood from sustainable fisheries and package it with the utmost care. From the icy-depths of Alaska's oceans, to our freezer, and on to your table, our products are carefully handled each step of the way. We think you will agree that our gourmet Alaskan seafood is the finest around. From our family to yours, enjoy!